Some months ago I received a gift of za’atar, a remarkably versatile Middle Eastern spice. Although I didn’t know it by name, the taste was familiar. First encountered at the table of Lebanese merchants in Liberia, I’d enjoyed the flavor at the home of friends, and in an assortment of restaurants featuring Levantine cuisine. No single recipe exists for the spice, but certain ingredients are traditional: sesame seeds, salt, cumin, Mediterranean thyme, Greek oregano, marjoram, and — most surprising to me — sumac. On the back of the box I received, the ingredient list included oregano, roasted sesame seed, olive oil, Dead Sea salt, and sumac. A common shrub in many areas of the world, sumac is characterized by deep red berries which can be dried and ground into coarse powder; I was surprised to find sumac available even in our local chain grocery stores. Often described as having a tart, cranberry-like flavor, sumac complements other spices used in za’atar, and helps to enhance any number of dishes from dips to desserts. I first tried za’atar as a rub for salmon, and it became an immediate favorite. At the same time, the familiar metaphor — “a taste of fall” — took on new and piquant life. Quite remarkably, sumac tastes as good as it looks. I’ve drunk sumac-ade made from flameleaf sumac fruit. I haven’t seen any reports of our local species getting used as a seasoning. Have you? My hill country foraging friend says she made her own sumac powder a time or two, but found it more convenient and less trouble to buy it from a spice company. I found some articles that offered instructions on how to prepare it, as well as listing the sumacs that are acceptable. Here’s one from Austin that includes flameleaf sumac and smooth sumac. I was interested to see that there’s a ‘lemonade sumac,’ but it seems to be limited to the west. Thanks for the link. I can see where it takes a lot of work to prepare sumac as a seasoning. Given the extensive list of benefits that can be derived from the plants, maybe the author thinks (consciously or otherwise) that they are geniuses. But wouldn’t that be a genera-lity? Probably. It might even be specie-ous. I have never tried it – at least to my knowledge. It really is good. I’ve tried it on grilled veggies, and a hot chicken salad, and with olive oil as a dip. I love lemon, and it has a bit of the same tang, although it’s not quite as sour. Sounds like something I’d enjoy, thanks. I don’t recall ever having any sumac, Linda. Aren’t there some varieties which are poisonous, or am I thinking of its cousin poison ivy? I guess as with anything, one has to be particularly careful to choose the right variation. That said, it must have an interesting flavor! There certainly is poison sumac, but it has white or gray berries, which makes it fairly easy to distinguish from the non-poisonous. Here are some photos that show the differences. Just as with mushrooms, or nightshades, or any other plants that look good enough to eat, it’s important to be sure. I’m certain about mint, dandelions, and dewberries, but beyond that, I wouldn’t do much plucking without consulting someone who knows that they’re doing. Though I haven’t used the spice, I am familiar with it from restaurants. Didn’t know about the sumac. The plant is brilliant against the blue sky. I’ve been aware of restaurants named Za’atar (or Zaatar) for some time, but had no idea that the names were derived from the spice. I still wouldn’t have known about the inclusion of sumac in the mix had it not been for that box with the ingredient list on the back. It was quite a revelation. The sumac is beautiful, isn’t it? It’s one plant we can usually count on for nice autumn color, and this one certainly did its part. While I shopped at a Lebanese store in Gbarnga, Linda, I never ate at a Lebanese home. So I missed out on the spice. I’ve probably had it at a Lebanese restaurant but wasn’t aware. I’ll keep an eye out for the sumac spice. And next time I find myself at a Lebanese restaurant I’ll pay closer attention. Now I’m pondering. Given a choice between chicken feet and Gerard’s bull head tacos, which would I choose? I couldn’t imagine a plate of the tacos — until now. Surely you’ll have a story for us somewhere down the line. Speaking of Liberia: whatever happened to the chicken feet there? They couldn’t have been simply thrown away. Were they a delicacy? Made into soup? If soup was good enough for the fruit bats and tree snails, surely a chicken foot or two wouldn’t hurt. Inquiring minds want to know. I’m obviously well behind the curve on za’atar. I’m certain now that it’s been included in hummus, yogurt dips, and flatbreads I’ve had. I found out today that a friend uses it on scrambled eggs. Like Chicken Man — it’s everywhere! it’s everywhere! They did love to tease about the pets, didn’t they? I got curious about chicken feet recipes (what do you do with those, anyway?) and found a whole lot of folks stewing, steaming, and deep frying them. I found one woman in central Washington with a great blog and this entry, titled, “Eeeww — you eat what?”. You might get a kick out of it. I certainly did. And then there’s this: I came to love several of my Swedish grandmother’s dishes, and looked forward to them every year. Then, I grew up and found out what was in them. If I’d known at the time, I never would have eaten them. Now? I still try and find them every holiday season. Oh, great! I think you’ll like it. There can be variations (as I’ve recently learned) but the basics are the same, and they’re good. Middle eastern cuisine is an area into which I have yet to venture. However, if it involves flat bread, I’ll probably like it. It certainly can involve flatbread. I’m thinking a combo of pita and hummus, or perhaps olive oil and za’atar for dipping. Here are a few recipes/suggestions. Check out the mujadara, especially. I think that’s next on my list to try. We have a local sumac that makes a delicious tea. After I read your comment I did some exploring, and several sources said sumac tea had been “a traditional Southern way” to deal with the extreme heat of summer. I’ve never heard of such a thing, but if it’s true, my life in the coming months might be improved substantially. It’s too late to collect berries now, but I found one seller online. I might just give it a try. It certainly couldn’t hurt, and even if it doesn’t have cooling properties, it should taste good. We always mix Moroccan spice with almost anything. It has most of the above mentioned spices. Garam masala is the other one. Of course, your mentioning of salmon has me just about ready to go and get a couple of cutlets. Wasabi is what we rub on the salmon though. When I was learning to prepare north Indian/Punjabi recipes, I roasted and ground my own garam masala spices, and it was great fun. I wasn’t familar with Moroccan spice, but when I saw the ingredients, that was familiar, too. What’s interesting is that the spice mix my Swedish grandmother used for her meatballs is almost the same as garam masala, save for the cumin. I’ll pass on the Wasabi, though. What I’ve had in the past is a little too much for me — but perhaps your spice and way of using it is better than what I’ve experienced. I’ve heard of Sumac, but have never seen it. 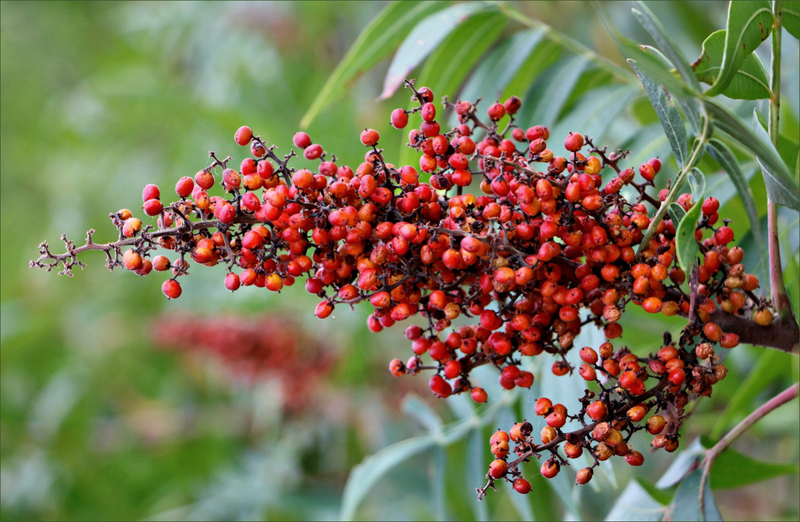 Thanks for sharing photos of the plant and berries. A friend who has travelled widely and lived in several different countries and a great cook probably has it as a staple on her kitchen shelf. 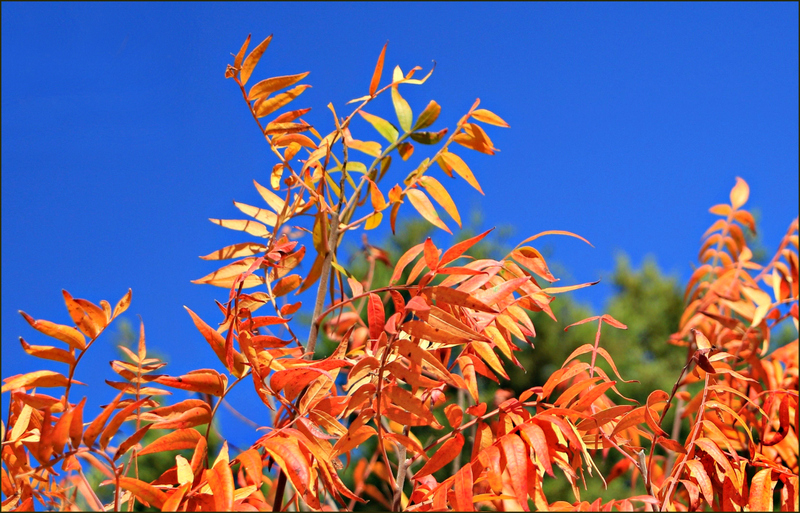 I think all of the sumacs are lovely, and it’s nice to have its color in the fall. Sometimes it’s tall and lanky, but sometimes it stays lower to the ground and spreads, like it did on this Kansas prairie. It wasn’t until I started thinking about this post that I made the effort to look at the spice display at the grocery and found sumac there. I suppose it’s been on the shelves for some tim, and I just didn’t notice it. I read somewhere that certain Middle Eastern cultures use the sumac plain, sprinkled on top of eggs or other dishes, much as we use paprika. Absolutely, invitations! I’ve spent entirely too much time browsing recipes tonight, and this one, for Baba ghanoush with sumac almost sent me out the door for eggplant. While she used plain sumac, I think the za’atar would work just as well. It’s worth experimenting. The photo of the berries is from a plant a friend has in her yard. She says it’s been very well behaved for a decade or so, the deer leave it alone, and every spring it’s covered with pollinators. I found this somewhat quirky site that has some photos. If you scroll down to the fifth photo, I believe those are your blue orchard bees buzzing around. It’s pretty clear that adding a sumac would make all of your bees happy. Exploration and discovery always are fun. If it hadn’t been for that gift from a friend, I might have spent the rest of my life seeing sumac as nothing more than a pretty plant that provides food for birds and animals, and autumn color for humans. All of this was pretty interesting to me, too. Ran across that unknown one in a list while poking around herbs and spices for my last post. I’m not much of a forager myself. Dewberries and agarita, sure. Prickly pear, if I wanted to go through all that. And certainly cress, dandelion, grapes, and nuts. I’ve even added yaupon tea to the list of acceptables. But beyond that, I’m reluctant to try much. There are so many good companies where you can buy spices and teas now, it’s easier to find things. Even Randalls has ground sumac in their spice offerings. Amazing. That sounds like a wonderful rub. I do love cooking with rubs, don’t you? They had a wonderful flavor without a sloppiness and smell so wonderful. I see a good deal of sumac around here and have often wanted to taste it — but I know there are often many versions of plants, some good and some not-so-right! Best to stick with the market! I will look for this spice at the specialty market. You won’t have any trouble finding it, Jeanie. There are recipes all over the internet for a variety of dishes using za’atar; clearly, it’s been around for a while (in centuries, not months) and it really is good. As for the sumac plant, sorting the good from the bad is pretty easy, since the poisonous has white or grayish berries, and the yummy has red, maroon, or rust-colored berries. Still, I’m with you. Better to know what you’re getting than to risk bad side effects! The Ditch sumac has the red — but I think I’ll head for the market instead! I’m not sure I trust the ditch! Given your travels, I wouldn’t be at all surprised if you’ve enjoyed it. I associate it with Middle Eastern cuisine, but the Wiki says it’s used in South Asia, too. Some za’atar doesn’t include it, but many of the recipes for it do. I have no doubt you’ll be able to find the za’atar, and it’s delicious. This is a must-see plant for me since it’s not in the Caribbean.The colors are beautiful! It is a beautiful plant. We had especially nice color last fall; it’s not always so glorious. And, there are color differences among species, but it’s generally a very nice plant. I always wondered if it was the same sumac in za’atar that we have here. I used to get za’atar bread on Atlantic Avenue in Brooklyn, fresh from the oven, many – like more than 40 – years ago! It was so good. I have a packet and haven’t used it – on fish sounds like a great idea. Beautiful, fresh-looking images! There are several species of edible sumac, so it may not be exactly the same, but sumac it is. One thing I found interesting is that there’s an actual plant called za’atar (Origanum syriacum) which may have been the Biblical hyssop. The first paragraph here has some details. It is a great seasoning — my new favorite. And, as you noted, the plant itself can be beautiful, especially in the fall.